It is that time of year again where one of the most amazing wildlife spectacles take place in the dry zone jungles of Sri Lanka. On the shores of Minneriya and Kaudulla National Park, elephants from all parts of the north-central jungles ‘gather’ to feed on lush grass from the tank beds to quench their thirst. 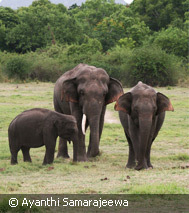 Ranked sixth on the best wildlife spectaculars list by Lonely Planet this is a must-do experience for anyone visiting Sri Lanka between July and September. As the drought in the north-east part of the country starts from the month of May, most of the usual feeding grounds and watering holes of elephants in these regions dry up. The receding water levels of both the Minneriya & Kaudulla tanks however results in the growth of lush green grass which has become a major source of food for the elephants during these tough months. The Gathering which starts around the month of June every year peaks during the months of August and September where the zone is at its driest. On an evening safari to Minneriya National Park one can be sure to see small herds coming together and building up large elephant herds that can number from 100 to 150 animals. There have even been instances where this number has been as high as 300. For those of you who are visiting Sri Lanka during this time, I highly recommend that you do a visit to Minneriya or Kaudulla National Park to see this wonderful spectacle. The best way to experience these wonderful animals is to ask your safari jeep driver to park the jeep in a place that does not obstruct the natural path of the elephants and watch them silently as they feed their way through the grassland towards the water where you can watch them at their happiest while drinking up their fill and cooling off in the water. Watching elephant babies play and interact would be some of the most interesting and breathtaking moments of your safari so keep an eye out for them as they run around between the adults in the herds who are very protective of them. We urge to you use a tour operator and jeep supplier that does not behave in a way that would harm or disrupt the natural behavior of the animals. There have been many incidents in the recent past where jeeps go too close to the herd scaring them back to the forest, meaning they end up hungry and thirsty for the rest of the day. Parking a jeep across the path of the elephants could distress the animal and can lead to elephants charging jeeps which can put you in a very unsafe situation as well. You have the right to ask your guide and jeep driver to ensure that they conduct themselves in a way that puts the elephant’s welfare at utmost importance, making your experience as well as the elephants’ most rewarding. The gathering truly is a spectacle of nature. The photograph depicts one tusk john, a regular at minneriya.